Tom Boonen’s difficult season rumbles on, with the Belgian being uncertain about his chances of starting the Eneco Tour on August 12th. One week ago his Omega Pharma Quick Step team confirmed that he would miss the Tour of Denmark due to a saddle sore problem. That issue has persisted, with the rider confirming to Sporza that he has not been able to train since the Tour de Wallonie, which ran from July 19th to 24th. He told the newspaper that he was due to meet team doctor Yvan Vanmol today about the matter. 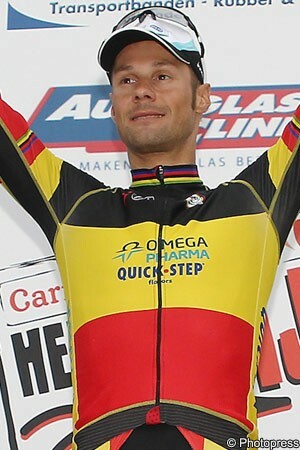 Contacted this afternoon by VeloNation, a team spokesman said that it would likely be tomorrow before further news is confirmed about Boonen, and whether or not he would be able to do the Eneco Tour. Boonen has had the saddle sore issue in the past and will be frustrated by its reoccurrence. He was afflicted by it in the 2011 Vuelta a España and spoke about it in somewhat graphic terms then. Enjoying a very strong season last year, including victories in a number of one day races including Paris-Roubaix and the Ronde van Vlaanderen, he was hoping for a similarly strong 2013. However he had bad food poisoning in December, ending up in hospital, and was once again taken in for medical attention in January due to a very bad infection in his elbow. That week-long stay caused him to miss the Tour de San Luis and the Tour of Qatar, and he was short of form heading into the Classics season. His frustration was further compounded when he crashed out of both Gent Wevelgem and the Ronde van Vlaanderen. He missed Paris-Roubaix due to a fractured rib. Boonen appeared to be getting back on track when he recently won the second stage of the Tour de Wallonie, but things have become complicated once more due to the groin issue.